Title Card: On December 26th, 2004, the deadliest tsunami on record hit the South East Coast of Asia. The lives of countless families all over the world changed forever. This is the true story of one of those families. Q: Why were Maria and Lucas hit by a second wave coming from the opposite direction to the first wave? Q: What's the long, stringy thing Maria pulls out of her mouth when she's vomiting? On vacation at an exotic resort in Thailand, a family of 5 are torn apart by a large tsunami that rips the island apart. The mother, played by Naomi Watts and oldest of the three sons do their best to survive while the father, played by Ewan McGregor, juggles between the safety of his two boys and the search for his wife and missing son. Director Juan Antonio Bayona vividly shares the shocking and yet, miraculous story of the Alvarez family. The cinematography when the tsunami sweeps in is nothing short of stunning and captivating. A glimpse of the sheer force and destruction behind this natural disaster will undoubtedly leave you breathless. Watts delivers a strong performance as does McGregor but the stand out here, besides the cinematography, is the brilliant and mature portrayal of the oldest son by young, Tom Holland. 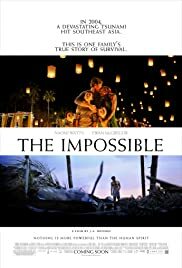 An emotional tearjerker, The Impossible is a brilliant film, which will have you glued to the screen as you root against the odds while simultaneously fearing the worst. The fact that it's based on a true story is a testament of the human spirit and the bond of a family. The Impossible is definitely one to watch.